here at vivint, we’ve always been committed to giving back. from habitat for humanity to the ronald mcdonald house, feed my starving children to sub for santa, we are looking for every opportunity to help families and communities in any way we can. in april, we added the focus of helping children with intellectual disabilities and are grateful for the opportunity to help in this important cause. since april, vivint volunteers have banded together to build three separate sensory rooms for children with autism in south jordan, utah; san antonio, texas; and most recently in orem, utah. these sensory rooms often have fun items like slides, swings, and beanbags to help the kids calm down and relax. most recently, 75 vivint volunteers came together to help jackson, the son of a vivint employee. 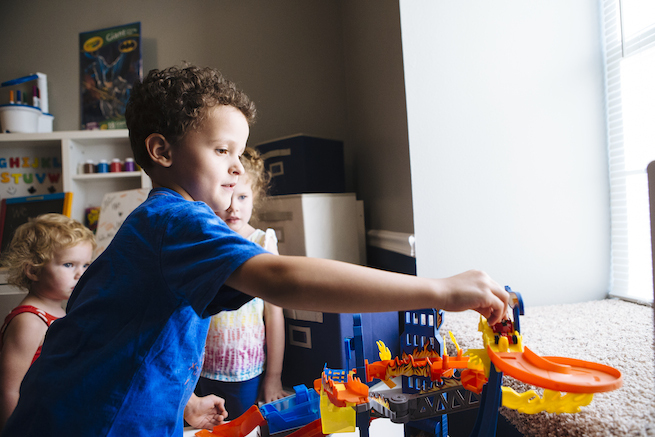 volunteers renovated jackson’s bedroom and created a sensory room for him. in jackson’s bedroom, vivint volunteers replaced the flooring, painted the walls, and replaced the furniture for a total bedroom makeover. in the sensory room, volunteers installed rubber flooring, a swing, a work bench, a love sac beanbag, and a tv with new movies for jackson to watch. vivint has plans to complete more sensory rooms for children with autism by the end of the year.